Home Tennis Australian Open: Stefanos Tsitsipas Defeats Defending Champion Roger Federer, Makes History! 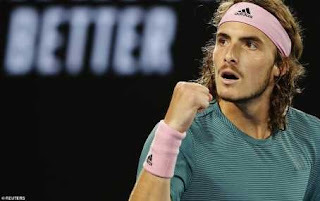 Australian Open: Stefanos Tsitsipas Defeats Defending Champion Roger Federer, Makes History! 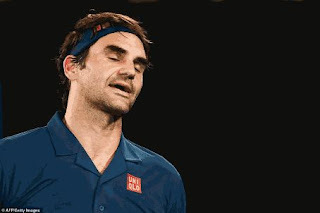 Australian Open Defending champion Roger Federer is out after Greek 14th seed Stefanos Tsitsipas earned the biggest win of his career to reach the quarter-finals. The Swiss lost 6-7 (11-13) 7-6 (7-3) 7-5 7-6 (7-5) on a dramatic night. Federer, a six-time champion, failed to reach the last eight in Melbourne for only the second time in 16 years. Tsitsipas, 20, saved all 12 of 37-year-old Federer's break points on his wayto a famous win. MySportDab report the 20-year-old player became the first Greek man or woman ever to reach a Grand Slam quarter-final. "I'm the happiest man on earth right now, I can't describe it," he said. 'I actually from the very beginning I kept the mindset to believe inmyself and my capabilities. "Roger is a legend, he showed such goodtennis over the years, I have been analysing him since the age of six. It was a dream come true facing him. Speaking after the game, Federer admitted he made mistakes against Tsitsipas. "I have massive regrets, you know, tonight,” he said. “I might not look the part, but I am. “I felt like I have to win the second set. I don't care how I do it, but I have to do it.